One of our SGSCA members has photographs on display at Essential Bakery (corner of Madison & MLK in Madison Valley). The photos are from a 2007 hiking trip in Italy, and are on display through the end of August. Additionally a reception will be held there on August 21st. Additional details to follow. The Seattle-Gdynia Sister City Association, in cooperation with Washington Business Week and the City of Gdynia, will be presenting “Gdynia Business Week” from August 16th – 22nd, 2009. Gdynia Business Week, inspired by Washington Business Week, is an intensive six-day program in which high-school aged students experience a simulated work environment, and develop business management skills. The City of Gdynia will host 100 Polish students, 5 Seattle students, and 11 representatives from Northwest corporations who will act as student advisors. The cities of Seattle and Gdynia, and the Seattle-Gdynia Sister City Association, envision this program leading to the establishment of a long-term relationship between Washington Business Week, Polish and Seattle-area corporations, and students. Speakers and guests throughout the week include: Gdynia Mayor, Wojciech Szczurek; Gdynia Deputy Mayors Michal Guc, Ewa Lowkiel, Boguslaw Stasiak, and Marek Stepa; United States Ambassador to Poland, Victor Ashe; former Polish Ambassador to the United States, Janusz Reiter; and Michal Jaworski from Microsoft, Poland. 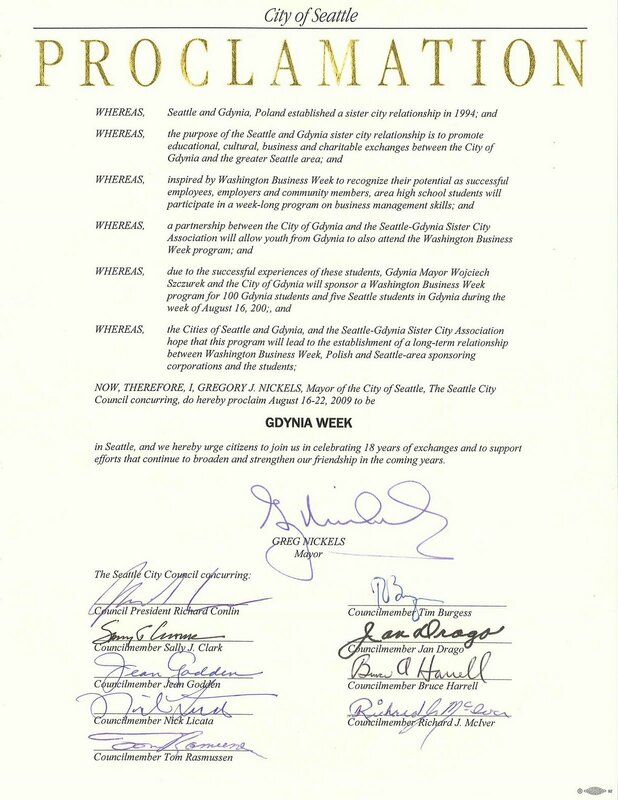 To simultaneously honor the event, Mayor Greg Nickels and the Seattle City Council have issued a Proclamation declaring August 16th – 22nd “Gdynia Week” in Seattle. 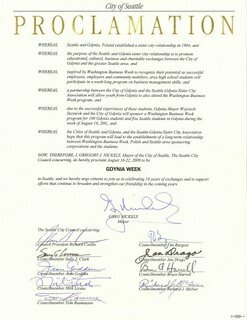 Citizens are urged to celebrate the eighteen years of sister-city relations between Seattle and Gdynia (Poland). The purpose of the Seattle-Gdynia Sister City Association is to promote educational, cultural, business and charitable exchanges between the city of Gdynia, and the greater Seattle area. The Polish Home received an $80,000 grant from the City. However, it is a matching grant and they need to receive new donations before the grant can match them. This is a fantastic opportunity and we are calling on your support. No donation is too small! For additional information on the grant, the fundraising, and the project please visit The Polish Home Foundation‘s website.